Posted on September 22, 2015	by Katy K.
In case you missed it, there is Cybils excitement! This year’s judges have been announced, and I’m once again honored to be on the Cybils Middle Grade Speculative Fiction team. Our fearless leader Charlotte and myself are the only ones returning to Round 1 from last year, though everyone else has different Cybils experience, and I spent rather too long yesterday checking on my team members from last round – still doing Cybils, as it happens, but on different panels. I’ll miss you, friends! And very much looking forward to getting to know my new team members! But there are still books to be talked about… I first read John David Anderson when Sidekicked was on the Cybils shortlist in 2013, and I loved it. I was very excited to see this book! The Dungeoneers by John David Anderson. Harper Collins Children’s, 2015. This is a story that feels – at least at the beginning – like being plunked down in the middle of a role-playing game come to life. Colm Candorly, our hero, is a cobbler’s son with eight sisters – which is to say, growing up in poverty. His family is horrified when he delivers a pile of much-needed coins to pay for his sick sister’s medicine – they know it must be stolen. But on the way to the magistrate, professional rogue Finn Argos agrees to take Colm on as an apprentice and take him to be trained at Tye Twodin’s famous Guild of Dungeoneers (cue the theme music.) Finn assures Colm that he, Colm, is no common pickpocket but has the potential to be a Rogue, a key member of Dungeoneering team. Also on Colm’s new team are the shy young mageling Quinn Frostfoot, tough-as-nails (unless she’s bleeding herself) barbarian-to-be Lena Proudfoot, and druid-in-training Serene (who is a person of color and also has a pet spider named Mr. Tickletoes.) 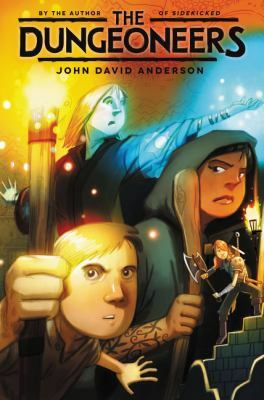 All four kids try to make their way at dungeoneering school, navigating classes in swordplay, spells, and lock-picking, while trying to navigate the social pitfalls of a boarding school and learning about why it is that there is booby-trapped treasure to be found buried in mountain tunnels all over. So I was going happily on, enjoying the adventures, with my only complaint being that I didn’t see much happening in the way of character development for the rest of Colm’s team, but not minding terribly because of liking Colm fine. Then Anderson pulled his sucker punch, like he does, and suddenly the light adventure was no longer just a light adventure, but contained deep thoughts about morality and loyalty. I can think of quite a number of young boys and girls of my acquaintance who enjoy making up similar fantasy adventures on their own, and would very much enjoy this book, with its teamwork and adventure and humor. And I am very happy I read it myself! This entry was posted in Books and tagged youth fantasy. Bookmark the permalink.